Looking for an old address with only a Terrace Name? A series of articles prepared from the Royal Windsor Website Forum posts featuring memories of our readers' days at Windsor schools. These have been edited together to provide a fascinating insight into life at the school from as early as the 1930s. A Coach Trip from London to Windsor in 1874 A colourful description of a horse-drawn coach journey from London to Windsor in the spring of 1874. A History of Windsor's Water Supply An article by Gordon Cullingham, the last Borough Engineer of Windsor. A comprehensive list of residents in Peascod Street as researched by Jane Lindsay from the 1851 - 1901 Censuses. Occupations in Victorian times in the slum area known as Bier Lane and subsequently demolished to make way for River Street Car Park. Jane Lindsay's detailed research of the censuses from 1851-1901. During WWII many events took place around the country to raise money for the 'war effort'. Windsor was no exception. In 1944 the borough organised 'Salute The Soldier Week'. It is 1945, just after the end of the war, The Labour Party have defeated Churchill in the national elections, and the local Windsor Labour Party have their eyes set on winning the local elections too! What plans do they have for the town? With the benefit of hindsight what came true and what are we still waiting for? A listing of Clewer's War Dead from both World Wars. An ongoing project for which contributions, corrections and updates are always welcome. ARP Activity Contemporary notes of incidents as the ARP rescue parties were sent out to see what they could do. School day memories of days out, school trips and holidays on these old Windsorian Coaches. Now lost to Windsor, The Royal Albert Institute was built in memory of the late Prince Consort, Prince Albert, and opened in January 1880. Windsor was once an 'Underground' station!!! A contemporary report of the laying of the foundation stone for Trinity Church by Prince Albert. April 4th 1842. The area to the west of Windsor could have looked very different if GWR plans to link Windsor and Ascot by rail had gone ahead. In this story we feature GWR's map of the land purchased for the line's construction. The Two Railways of Windsor A preliminary article featuring both old and new illustrations and photographs of Windsor's two railways. A fuller history of the two lines will be featured here when researched. The Oldest Photograph of Windsor? There is no doubt that this is an old photo as it features the earlier roofline of the Curfew Tower. Charles Street, market place, car park and now busy road Charles Street, market place, car park and now busy road. Ashley Booth has kindly provided pictures of Charles Street under construction. We would like to hear from anyone who has the precise date of this redevelopment. Gazeteer Entry for Windsor in 1791 The General Gazeteer or 'Compendious Geographical Dictionary in the Known World'. Windsor's entry from 1791. The Curfew Tower Belfry In 1863 the old belfry on top of the Curfew Tower was covered by the roof line we know today. Featuring three very early, exceedingly rare, photographs of the earlier belfry as well as Victorian images of 'work in progress'. Story and pictures of Curfew Tower. Beauty or Beast? Opinions differ about the major 1969 housing development opened by the Queen near the centre of Windsor on June 23rd 1969. Also includes pictures and details of the shops in the lost section of Oxford Road. Raising the Flag The Windsor Castle flag staff mystery plus information about the Union flag and flying the flag at 'half mast'. Windsor's Saluting Cannons The Royal Borough has fired Salutes in Windsor since 1754! History plus pictures of Salute for Queen Elizabeth's 76th Birthday in 2002. Christmas Trees at Windsor A brief history of the earliest known Christmas trees at Windsor, in 1800, Prince Albert's influence and the Christmas Tree on Castle Hill with the annual Carol Concert. Coat of Arms of The Royal Borough of New Windsor, 1566 A description of The Coat of Arms of The Royal Borough of New Windsor, dating from 1566. Shopping in Windsor 1969 The cost of living in Windsor compared to Stonehouse, Gloucestershire. Two bills from Christmas 1969 featuring fruit and vegetables. A Peep Behind the Ivy The Old Burial Ground at Bachelors Acre and pictures of Charles Knight Gateway. The Windsor Martyrs Robert Testwood, Henry Filmer, Anthony Pierson, John Marbeck and Robert Bennett. Indicted for heresy in Henry VIII's reign. The Fascination of Directories A short essay about the Directories of Windsor in Victorian Times and before and where to find them. Vansittart Road Recreation Ground, 1989 The Borough Council tried to sell off Vansittart Rec in 1989. Read why the protesters were so up in arms, and how the battle was won. The Civic Trust Scheme, May 1961 The story of the major repainting of Windsor High Street in May 1961 plus down comes the Castle wall! Bachelor's Acre 'Female' Tank 1920-1940 For around twenty years from 1920 to 1940 a World War I tank was on display at Bachelor's Acre. Photos and story. The Floods of 1947 The worst floods of the century in Windsor, caused by a long cold winter and sudden thaw - what was it like? The Floods of Victorian Times Flooding in Victorian times was a common event. In this story we feature a coloured view of Windsor during the floods of November 1875 from The Illustrated London News, plus other flood reports from 1869, 1873, 1877, 1891 and 1894. The Great Freeze of 1963 An extended period of cold weather froze the river Thames - boys played hockey and rode their bikes on the ice, Windsorians strolled across the Thames and BBC TV showed a car on the frozen river at Oxford! Do you have pictures we could use please?? A Brief History of Windsor This article provides an overview of Windsor's earlier history. Oakley Court Oakley Court was originally built in 1859 for Sir Richard Hall-Say and subsequently became famous as St Trinians, also featuring in the 'Hammer' horror films. The Imperial Service College An illustrated history of this important Windsor School from the 1840 to 1940s. The demolition of St Marks and Imperial Service College buildings, Alma Road The original St Marks School buildings from the 1870s, and the Goodhart Gates of 1926 in Alma Road were demolished to make way for the new police station, court house and other buildings in the 1970s. Pictures. A Description of Windsor Castle in 1870 A fascinating description of Windsor Castle and the surrounding area from 'Picturesque Europe' 1870. Includes history, wood cut engravings and a view from the top of the Round Tower! Alexandra Gardens - The Early Days Photographs of The Goswells and Alexandra Gardens, some over 100 years old, including the area before the garden's creation and the gun on display there in the 1930s. Early 1900s Promenade Panorama The famous Windsor Riverside was originally created in the late 1890s. Barry Avenue running alongside was named after Windsor's local MP. Story and pictures from 1890s to 2002, See also Early 1900s Panorama, a large format image of the first promenade. Taking Liberties with Post Cards The camera never lies, except when an artist decides a postcard would look better with bull rushes! Compare postcards! Sir Christopher Wren's House, Windsor Bridge The famous landmark by Windsor Bridge with an illustrious history. Windsor Town Hall (The Guildhall) Windsor's Town Hall (The Guildhall). The Most Noble Order of The Garter and the Associated Ceremony A fascinating history of Windsor taken from Charles Knight's Guide to Windsor, published in the early 1800s. Here we have prepared in a modern format texts originally researched, written and printed almost 200 years ago. Much has happened to Windsor Castle in the intervening period, not least the major changes undertaken in the 19th century, and even more recently, following the Great Fire of 1992. This series of articles covers the period prior to these changes. As time permits, this substantial base of information will be expanded, illustrated and augmented. We would welcome your comments and contributions towards this major project. A flurry of bridge construction in Victorian times followed by rebuilds - and a second flurry in the 1960s. Frogmore House and Mausoleum The last resting place of Queen Victoria and her husband Prince Albert. Pictures and description. State Visits to Windsor Windsor and London alternate in hosting State Visits where an honoured guest from overseas processes to the castle upon their arrival in the company of the monarch. Horses' Many events took place in Windsor throughout 2002 to celebrate Queen Elizabeth's Golden Jubilee. Find out more here. Main stories are lnked direct. The Kings and Queens of England Forgotten the dates of English Kings and Queens? Try here! Also a summary of what additions and changes each made at Windsor Castle. The George V Memorial, Thames Street The unveiling in April 1937 by King George VI, at junction of Thames St and Datchet Road and related photographs and background. The Royal Pageant of the Horse, 1997 The celebration of the Queen's 50th Wedding Anniversary that the rain put paid to! Queen Victoria's Statue, 1897 In 1897 Queen Victoria's Statue on Castle Hill was given a canopy for the duration of the celebrations of Victoria's Diamond Jubilee. The Funeral of Queen Victoria Photographs of the processions and letter describing how the Royal Navy came to haul the gun carriage on foot. The Funeral of Edward VII Funeral procession 1910. Accession of George V Photo 11th May 1910. Mayor, Cllr. C F Dyson and Aldermen proclaim the accession of George V plus two views of the State Entry into Windsor on July 1st 1911. Proclamation of Queen Elizabeth II Mayor, Cllr. Tozer and Aldermen proclaim the accession of Queen Elizabeth II on Castle Hill. Includes photos and Proclamation text. February 1952. Princess Margaret Rose, Countess of Snowdon 1930 - 2002 Princess Margaret Rose spent much of her childhood here at Windsor with her older sister, Elizabeth, and their parents, George VI and Queen Elizabeth the Queen Mother. 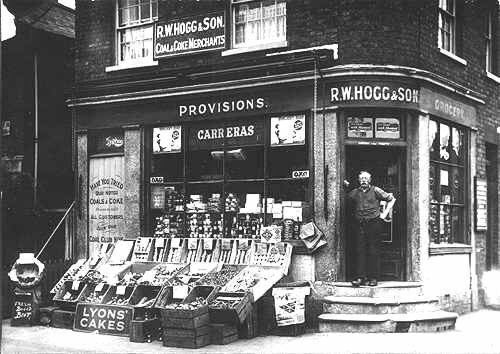 Hogg's General Stores 1930s A local corner shop in the 1930s at the junction of Oxford Road and Alma Road with the shopkeeper standing in the doorway. Story and picture. 1. St. Stephens Primary School Vansittart Road - Rosie's article 2. St. Stephens Primary School Vansittart Road - Carole's article This feature now comprises two articles. The first was provided by Rosie Burnett, nee Kyte, who now lives in Australia. Rosie left Windsor in 1973. The second was provided by Carole Freeman, nee Miles, who now lives in Canada. Windsor People Dedicated area about Windsorians, famous and not so famous! This will take some time to grow so we need your help!! The Home Guard In Windsor in World War II Recollections of local historian, teacher and councillor, Ray South of Windsor's "Dad's Army"
Billy Wilkins - Flag pole bees waxer! The man who waxed the castle flagpole! William de Braose and St Leonard's Hermitage William de Braose, a character from the Middle Ages. Excerpts - 'Passages of a Working Life' By Charles Knight (Founder, Windsor Express). This excerpt describes a visit by George III to Windsor theatre. Miscellany - Just for the fun of it!